Spend some time downtown enjoying all Pulga has to offer or hike around to the nearby natural wonders of the canyon. If you want to explore Pulga and beyond, take a look at our list of nearby excursions. Take a swim at Pulga's own beach on the river! The natural shallow swimming pocket is a great place for kids to enjoy the river safely. Swim out to large rocks and sunbathe or, for the more adventurous take a walk up the tracks with a tube and float back down to our hole. 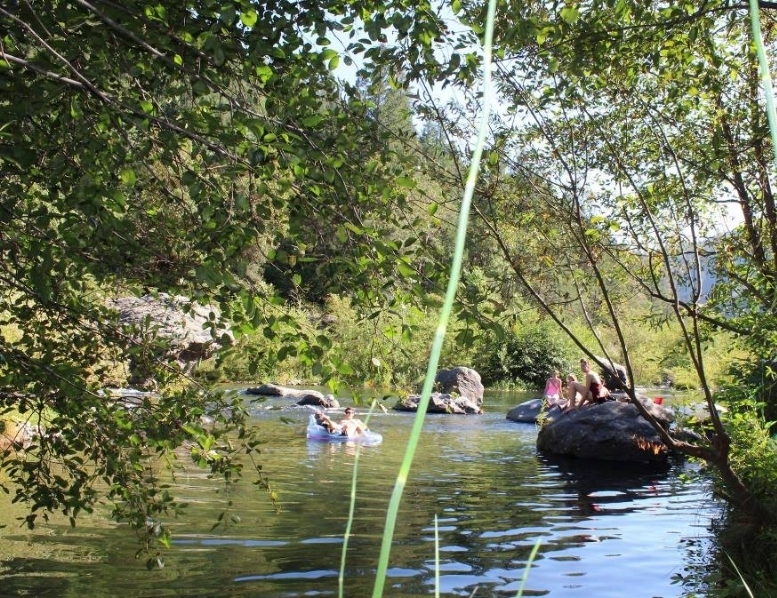 Cool off with a dip in the Feather River, just at the bottom of town. Our handy fishing guide will help you find our favorite spots for reeling something in. Our nook of the Feather River is home to plentiful native rainbow trout. With outdoor kitchens, ample seating, and plenty of workspace for food prep, Pulga's central communal space is perfect for parties, gatherings, or outdoor hangout. Pull up a stump or stake claim to a picnic table and relax under the cedars and pines. Play on the Pirate Ship Deck, Pulga's very own custom-built playground/stage/dance platform. No matter how you spend your time in Town Park, we're certain that it will be time well spent! Take the beautiful hike up Camp Creek Road and cool off with a dip beside the waterfall. Take Camp Creek Rd and continue past the jade mine to find one of Pulga's better-known natural wonders. A roughly-6-mile roundtrip hike past wild flowers and canyon views, this is a great leisurely walk or a perfect morning jog to take a dip and then stroll back down the hill to town. With Pulga's unique landscape, rare animals and trees, rich history, and eclectic cabins and furnishings, many feel inspired to create during their stay. Inquire about a stay in the Writers Nook, or take a turn at the drafting tables located in the Pink House or Schoolhouse. Located in the center of town, take a relaxing soak in Pulga's spacious tub. This rustic, elegant stone and tile tub is a the perfect spot to relax with a cold afternoon beverage or stargaze on a chilly night. Filled halfway, the tub can accommodate 6-8 people; at full capacity, the tub comfortably seats 18. Blackberry, elderberry, and wild grape run wild throughout town and down to the river. Enjoy picking from these at your leisure and help yourself to our 30 varieties of well-established fruit and nut trees around town. Follow our hand-illustrated field guide and see if you can gather them all! Make a smudge stick or arrange a native bouquet. Explore Pulga's unique natural landscape. Rich with biodiversity, and with our local field guide in hand, take a morning or afternoon to acquaint yourself with the rich variety of plants, animals, and fungi in the area.